From now until the holidays are here, you’ll find some great ideas on gifts every Monday. 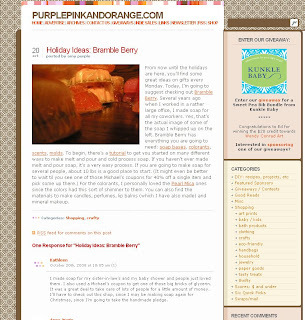 Today, I’m going to suggest checking out Bramble Berry. Several years ago when I worked in a rather large office, I made soap for all my coworkers. Yes, that’s the actual image of some of the soap I whipped up on the left. Bramble Berry has everything you are going to need: soap bases, colorants, scents, molds. To begin, there’s a tutorial to get you started on many different ways to make melt and pour and cold process soap. If you haven’t ever made melt and pour soap, it’s a very easy process.